J & J (1996) The 37 foot fishing vessel J & J was consumed by fire and sank August 8, 1996 at Korovin Island. Both persons aboard made it to safety. J AUS (1990) The 54 foot steel trawler J Aus disappeared and was presumed sunk February 28, 1990. The vessel was traveling from Blaine, Washington to King Cove, Alaska. Search efforts for the missing vessel were hampered by 60 knot winds and seas to 27 feet. All that was found was a life raft, an EPIRB and one survival suit. The raft was found 70 miles southeast of Cordova near Cape Suckling. Lost with the vessel were skipper Mick Aus of King Cove, Dave Strom and Tracy Hill. J H CROCKETT (1913) The 15 ton 64 foot gas screw J H Crockett was burned in Smugglers Cove, Helm Bay December 22, 1913. JACK HORNER (1913) The 50 ton 72 foot gas screw fishing vessel Jack Horner caught fire and became a total loss in Lynn Canal July 13, 1913. The 6 crewmen aboard made it to safety. JACKIE-R (1998) The 49 foot salmon seiner Jackie-R capsized and sank August 18, 1998 in Square Cove on the west coast of Admiralty Island in Chatham Strait. Fish shifting on deck during a haul caused the disaster. All five crewmembers abandoned ship to a skiff, were rescued and taken to Hoonah. JAGER (2011) The 42 foot steel Dungeness crab fishing vessel Jager sank in Chatham Strait west of Angoon October 6, 2011. The only person aboard abandoned ship to a liferaft and was rescued by the U S Coast Guard and transported to Angoon. JAPAN (1907) The British barge Japan was totally destroyed by an explosion of dynamite aboard July 10, 1907. The entire crew of the Japan were killed along with one crewman (Ernest Strand) from the vessel Marion, which was towing the Japan. The tragedy occurred while traveling from Ketchikan to Nobles, British Columbia. The location was off of Bold Island in Revillagigedo Channel. The Japan was valued at $1,500 and her cargo at $4,500. JAY M (1951) The 9 ton 29 foot wooden gas screw fishing vessel Jay M burned November 3, 1951 in Affleck Canal. JEAN (1937) The 8 ton gas screw fishing vessel Jean was destroyed by an explosion and fire at 5:30 p.m. September 15, 1937 at Six Mile Point in Blake Channel. The two crewmen survived and were treated for burns after being picked up by vessel 31B470. According to the report of casualty filed by Virgil Hulse, a member of the crew; the bottom of the gas tank fell out causing the explosion and fire. Hulse and master Warren Powers of Wrangell had left that day for a fishing trip with an expected return to Wrangell. The Jean was valued at $2,500 and had no insurance. JEAN (1964) The 7 ton 29 foot wooden gas screw fishing vessel Jean foundered July 3, 1964 at Cape Chacon. JEAN MARIE (1941) The 15 ton 38 foot wooden gas screw fishing vessel Jean Marie burned off of Kruzof Island July 19, 1941. The one person aboard made it to safety. JEANIE (1984) The fishing vessel Jeanie burned and sank September 3, 1984 at Point Retreat northwest of Juneau. Both persons on board were rescued by the Alaska State Ferry LeConte and taken to Auke Bay. JEANNIE LEE (1969) The gas screw Jeannie Lee burned November 11, 1969 in Pirates Cove, Sitka Sound. JENNIE (1942) The 20 ton 41 foot wooden gas screw fishing vessel Jennie foundered August 31, 1942 in north Port Alice, Heceta Island. JERICHO (1942) The 14 ton 39 foot wooden gas screw fishing vessel Jericho was consumed by fire August 17, 1942 one half mile west of the entrance to Hawk Inlet. JERRY S (1947) The 41 foot wooden gas powered troller Jerry S disappeared after leaving Sitka December 12, 1947 for Red Bluff Bay with three men aboard. The men were intending to trap in the area. 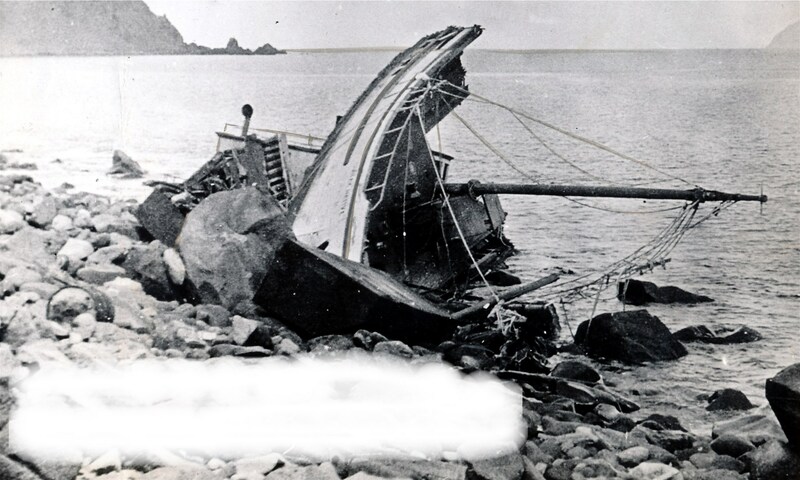 Wreckage of the Jerry S was found March 16, 1948 in the vicinity of Peschani Point. Lost with the Jerry S were Lloyd Williamson (43), Hulder Johnson (38) and Carl Buchanon (43), all fishermen from Sitka. JESSEL (1965) The 16 ton 36 foot wooden gas screw fishing vessel Jessel burned October 22, 1965 at Gould Island, Prince of Wales Island. JESSIE (1904) H J Burkhart was the master of the vessel towing the 44 ton wooden scow Jessie when she broke her towline and went adrift at noon Sunday December 11, 1904. The vessels had departed Ketchikan December 2, 1904 bound for Niblack, Alaska. The scow was carrying about 60 tons of lumber and shingles worth $440. Somewhere near Chasina Point on Prince of Wales Island two miles north of Wedge Island, the Jessie went ashore and broke up on the rocks. Burkhart had cruised in the vicinity four hours but found the seas too high to approach the scow. The Jessie was valued at $500 and had no insurance. JEWEL (1951) The 11 ton 33 foot wooden gas screw fishing vessel Jewel foundered November 15, 1951 in Chatham Strait. JOAN (1932) The 26 ton 44 foot wooden oil screw fishing vessel Joan foundered near Prince of Wales Island August 4, 1932. The three persons aboard made it to safety. JOHNNY E (1961) The 24 ton 44 foot wooden oil screw fishing vessel Johnny E burned in June of 1961 at the Icy Straits Cannery. JOHNNY O (1962) The 7 ton 27 foot wooden gas screw fishing vessel Johnny O stranded and was lost October 22, 1962 at Thomas Basin, Ketchikan. JOSEPH (1995) The 50 foot wooden salmon seiner Joseph ran aground and sank July 17, 1995 on Point Augusta. All five crewmembers were rescued by another fishing vessel. JOSEPHINE I (1961) The 14 ton 38 foot wooden gas screw fishing vessel Josephine I was consumed by fire June 1, 1961 at Juneau. JOSIE (1933) The 18 ton 41 foot wooden gas screw fishing vessel Josie burned at Karheen August 16, 1933. There was no one aboard at the time of the casualty. JR (1953) The 9 ton wooden gas screw Jr. burned October 9, 1953 at 55 14.6 N Lat. 131 26.5 W Long. in southeast Alaska. JUANITA (1921) Fire destroyed the 7 ton gas screw Juanita at 3:00 p.m. Wednesday January 19, 1921. The vessel was anchored in Surprise Harbor, where it had arrived that day from Tyee. The two crewmen were not aboard when the fire broke out. By the time they reached the Juanita they were unable to approach her because of the intense heat. The Juanita, valued at $2,000, burned to the waterline and sank. She was uninsured and had no cargo. JULIE (1966) The 20 ton 36 foot wooden oil screw fishing vessel Julie foundered November 16, 1966 at Meyers Chuck. JULIE K (2004) The 26 foot cabin cruiser Julie K capsized and was lost November 20, 2004 approximately 200 yards off of Horse Island west of Juneau. Both persons aboard were lost along with their two dogs. The two lost were best friends James Metlika (30) of Eagle River and Nick Mayer (30) of Hoonah. JUNETA (1942) The 14 ton 41 foot wooden gas screw fishing vessel Juneta was lost after a collision with the oil screw Rolph August 19, 1942 near Blank Inlet. JUNIOR (1951) The 11 ton 35 foot wooden gas screw fishing vessel Junior was consumed by flames February 4, 1951 in Carroll Inlet. JUSTY (1990) The 30 foot fishing vessel Justy flooded and sank June 20, 1990 near Robert Island. Both crewmembers were rescued by the fishing vessel Alaska Dawn.